The essence of IPM is to prevent the need for using curative treatments—liberal use of abrasive chemicals—by properly maintaining the landscape. But first and foremost, we must know exactly what potential weak points are on your property so we can fortify those trees, shrubs, plants, turf areas with nutrition to keep them strong. Schill Grounds Management’s team of highly trained professionals brings vast horticultural knowledge to your property. We carefully assess the landscape and take stock of what’s there, and potential risks. For example, a tree surrounded by blacktop parking lot will be more susceptible to insects, and therefore disease, because it is more stressed by its location, where the beating sun can strip away moisture. We can identify that one tree as a “risk” and focus on giving it an extra nutritional boost with our proprietary organic spray. Then, if a pest attacks that one plant, we treat just that tree — instead of making broadcast pesticide applications on every tree and shrub in the landscape. We always know what pests are active so we can keep an eye out for potential damage. We have an intimate knowledge of the plants on your property, and this helps us properly care for each one and treat them as individuals. When it comes to IPM, this “individual treatment” is key because it translates to using fewer chemicals. Replacing plants is expensive! And, if one plant is suffering from disease because of an insect attack, the chances are that other similar plants in the landscape are suffering. The last thing you want to do is replace 20-foot trees and 8-foot bushes that are not only costly but also difficult to source from nurseries. That mature plant stock is very challenging to find at this time of year, and if we do locate those larger specimens, you’ll pay a large amount of money for them. No one wants that. The solution is really quite simple: Take good care of the plants you have through IPM practices, meaning through proper feeding, watering and maintenance like pruning. Targeting specific plants for treatment rather than blanket treating the entire property with pesticides is a more sustainable landscaping solution because we’re using less product. For example, at Crocker Park in Westlake, we know this year that the honey locust trees are susceptible to aphid damage. On other properties, Alberta spruce trees and burning bush attract mites at this time of year, which we notice when leaves turn red or premature leaf drop occurs. For one, insects love to crawl into deadwood and mossy portions of trees and shrubs. Dead, decaying or stressed branches are an invitation for disease. Thirsty plants that are starved for nutrition will begin to fail, and that’s when insects and disease set in. Proper plant maintenance will prevent these stressful conditions. Plants that do not receive adequate moisture revert into stress mode. That’s why we make sure that irrigation systems are in prime condition and appropriately calibrated to provide much-needed water to trees, shrubs and turf. Our experienced maintenance crews understand that their job goes beyond making tall grass short. Proper mowing is critical to restoring the health of your lawn. Cut it too short and the grass gets stressed and expends energy (in the form of nutrients) to survive. What results is a lawn that’s susceptible to weeds and disease. Our bio-nutritional program using mostly organic products is like vitamins for your lawn, and proper mowing ensures that the grass is getting a healthy cut. Removing dead, diseased or dying branches from trees and shrubs takes away an easy entry point for insects. Professionals at Schill keep a close eye on plant material—they get to know these plants like they’re family. We manage and maintain individual plants, giving each maintenance attention. When’s the last time your landscape had a thorough ‘checkup’? Is your property being fed with proper nutrition and vitamins to stay strong? 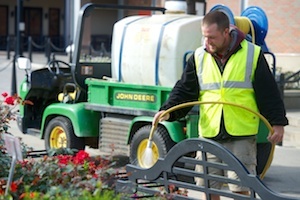 What proactive steps is your landscaper taking to prevent insects and disease? We ask these questions because so many companies focus on “treating” the whole property, and at Schill we take a different, more sustainable landscaping approach by using integrated pest management. 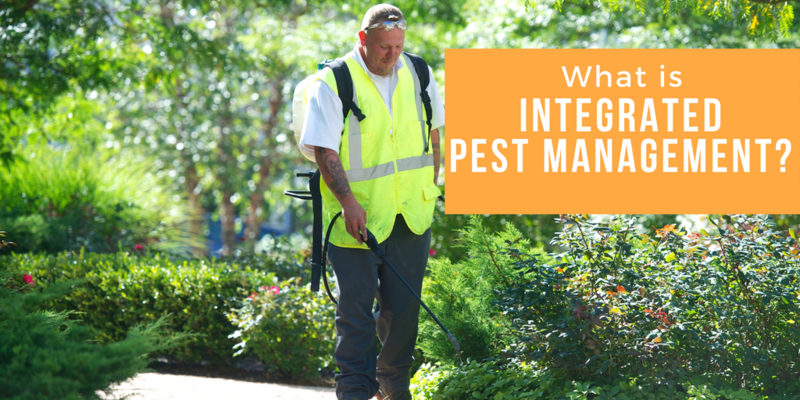 What IPM means to you is a healthier, “greener” landscape that thrives and naturally wards off insects, weeds and disease. Let’s talk more! Call us any time at (440) 327-3030, or fill out our simple contact form and we’ll get in touch with you.